SMS and MMS sweepstakes are a great way to create customer loyalty and are very cost-effective. They provide an interactive venue for you to communicate with your consumers to keep their interest piqued. 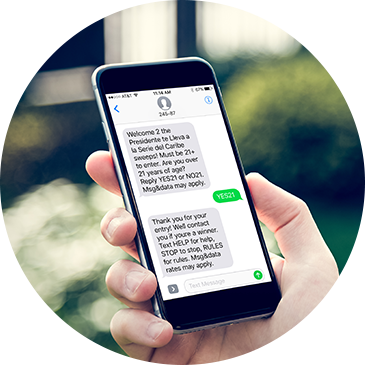 After obtaining the leads you receive from your first text-to-win campaign, you can keep the buzz going about your product or service by continuing to offer valuable incentives straight to consumers’ mobile devices. This will result in customer loyalty, brand awareness, and a continued increase in your CRM database. Text-to-win campaigns can also launch very quickly. We will create the flow of your text-to-win campaign, activate and launch it within a week. In addition, our legal team will review all of your copy to make sure the flow and language is in line with current FTC standards.